We put the tree up last night. I've got gobs of photos to share, but I'm too emotional at this point to go through them. As soon as the tree went up, Ollie parked himself under it. 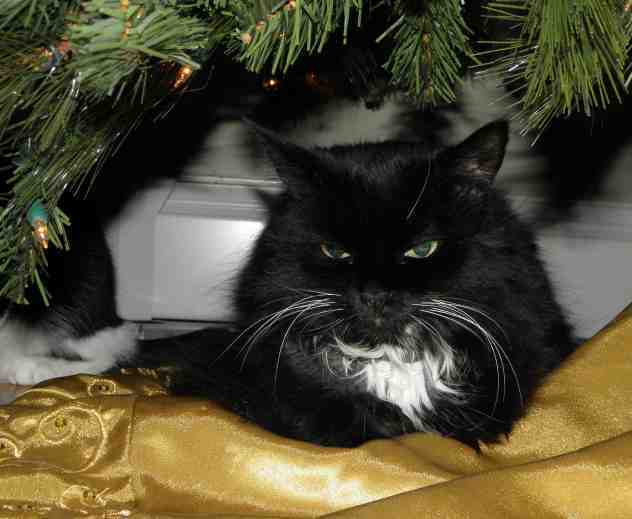 He has always loved the Christmas tree, and I can't help but cry over the fact that this will be his last. Even now.. Ok, moving on, I have a cute Peter photo to share.. It's hard not to think ahead, but it would be better to treasure every minute you have with him. Because reality is such that any of us, two-legged or four, could die at any moment of any given day. The world is filled with humans who assumed they'd come home at the end of the day, who assumed they had time to apologize, say "I love you," whatever, but who didn't. Who didn't make it home at the end of the day after all. So no, please don't grieve what isn't gone, don't waste your time with Ollie in that way. This is my first christmas in 18 years without my molly who died in September, it is a bit of an adjustment!